Aside from the On-Line Systems and SierraVenture packaging, most of Sierra's releases have never made it to the status of truly hard-to-find collectibles, due to Sierra's tendency to flood the market with their games. Not so in this case. Released in 1997, The Roberta Williams Anthology vanished almost as quickly as it appeared and is now quite hard to find. I was fortunate enough to snag mine at a local liquidation sale, the very last copy there. It's a nice tribute to the world's most recognized female game designer. Her early works -- Mission: Asteroid, Mystery House, Wizard and the Princess, Time Zone, and The Dark Crystal (a last-minute addition not mentioned on the box) -- are included as Apple II disk images with an emulator. 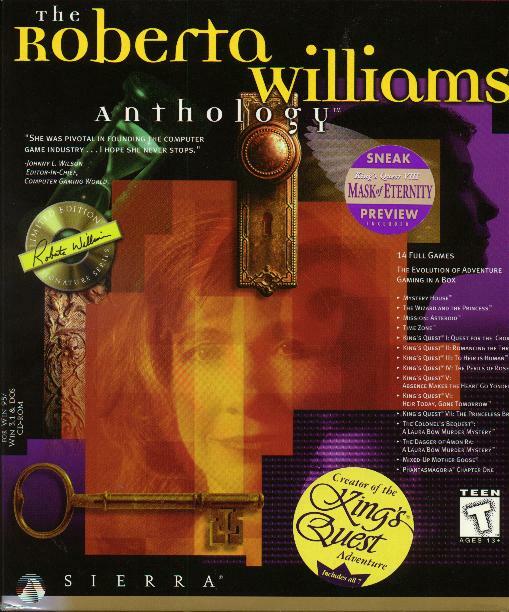 The complete King's Quest series (except for Mask of Eternity, in development at the time), along with Williams' 1990s works, is also present, plus a biography, some videos, and sneak previews.